Sunday was the first official race of my triathlon career. And I LOVED it! It was so fun. I actually think I haven’t had more fun on a race before. On Saturday we started our race weekend with a 9 a.m. beginner ocean open water swim clinic on the beach at Fletcher Cove, where the race would be held the next day. After a discussion of entry and exit techniques (Solana Beach Triathlon is a running ocean start) and general ocean water swim tips, we practiced running into the water. I must say it was pretty intimidating to run into the water. Not only was I afriad that I’d step on a sting ray and get stung (I’ve been stung and believe me it hurts! ), the floor of the ocean was very uneven and I kept falling into random holes. Once we got out far enough to swim, we found ourselves swimming through seaweed. At one point I looked over and Asia and my new triatlon friend Kim ( I met her at my TriClub pool swims) were covered in seaweed! After our practice swim, we changed and headed over to the Expo where we picked up our bib, timing chip, swim cap (purple for women 30 and under), and t-shirt. After the Expo, we had a delicious pre-race brunch with our good friends Asia and Jeremy. After some relaxing, that evening we went over to another friends house for a pre-race dinner. Nine friends ate pasta, bread, salad and frozen yogurt and discussed race day strategy, fears and excitement. When we got home, we set our all our race gear (luckily I got a handy triathlon check list from one of the vendors at the expo) and got to bed before ten. We woke up at 5 a.m. on race morning, ate our peanut butter banana toast, got our gear together and headed out the door. After stopping at 711 for our pre-race coffee ritual (started at the La Jolla half in April), we drove the five miles to the race start, parked and were at transition before 6 a.m. I was the first of the four girls (from our dinner party the night before) to arrive at the transition area. I picked what I thought was the best spot left, racked my bike (by watching others), and set up my two piles (one for bike stuff, one for run stuff). Shortly afterward Asia and Amber joined me in trasnsition and I got my body marked (arm, left thigh and left calf), made a bathroom trip and did some dynamic stretches. Soon after that, we were instructed to clear the transition area and make our way down to the beach. Once I was on the beach in my wet suit, putting my swim cap and googles on, it really became real. My nerves were in overdrive and I couldn’t wait to just start and get it over with. Asia and I asked the lifeguards which way the current was pulling and were happy to hear that there wasn’t a real current. We then asked them which side they recommend that we start on and they pointed left. To the left of the crowd it would be! After our lifeguard pep talk, we got in the water for a five minute warm up swim. When we came in, we lined up with the rest of the women 29 and under (this includes 25-29, 21-25 and 20 and under age groups) for our start. Our swim was delayed 10 minutes and the anticipation was killing me. The four of us (Amber, Vanessa, Asia and I) positioned ourselves at hte very front of the pack, but slightly to the south. We didn’t want to be right infront of the buoy in case the current pulled us north and we’d miss it and have to turn back to go around it. When the gun went off, adrenaline kicked in and I sprinted into the water. I ran as far as I could then started to dive under waves when they came. Sometimes I’d have to dive under, then stand up again then dive under another wave. Eventually I started swimming, probably a little bit before most of the others started to swim, but I was sick of trying to move forward on my feet. Although this course is short, the 100 meters to the first buoy seemed to take forever. As usual, I was pushed and bumped from all angles. 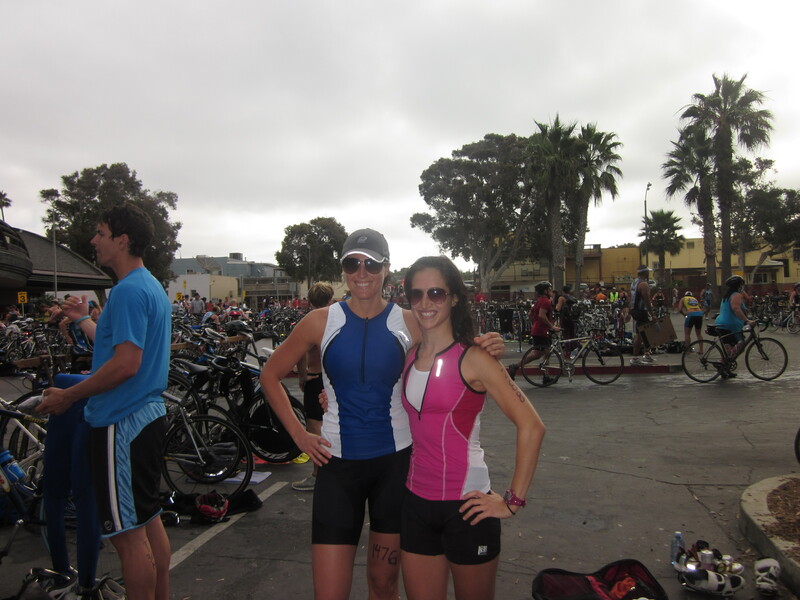 However, it was not as rough as my first beginner triathlon or either of the aquathons I have competed in. The aquathons can have up to 400 partcipants, including some pretty big men. The girls in my age group weren’t nearly as rough as those guys! While I worked my way parallel to shore to the second buoy, I tried to focus on lengthening my stroke rather than taking shorter, quickly strokes (as my friend and former college swimmer Miranda pointed out, my strokes are short considering how tall I am). I probably sited the buoy a few too many times (according to the swim talk on Saturday you can lose up to 10 seconds every time you lift your head to look for the buoy) and as usual, I veered to the left and had to move my way back into a straight line a few times. Overall though, I felt strong. When I finally reached shore and stood up, I felt that I was near the front of the pack. My swim cap had fallen off in the swim, but at least my goggles stayed on! As I made my way out of the water, I unzipped my wet suit and pulled it down to my waist. 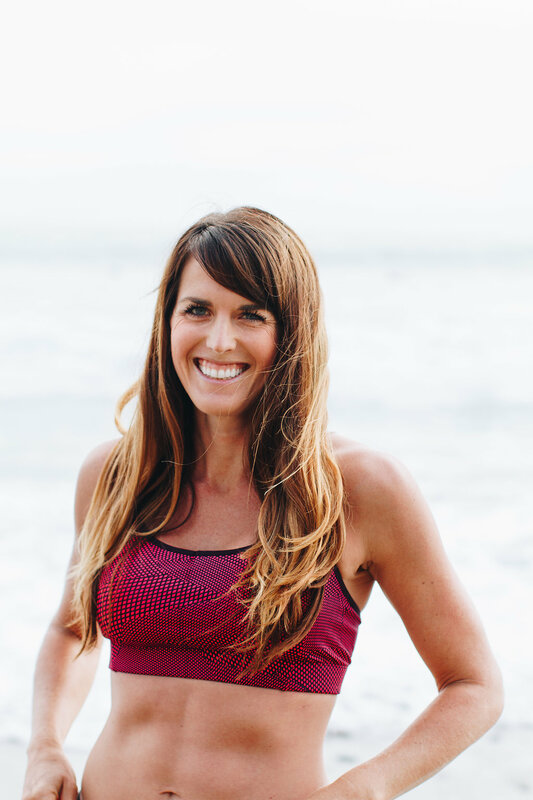 Once I was out of the water, I jogged up the very steep incline and made my way to transition (the reason this swim is so short – 400 meters – is because the transition is about 1/4 mile away from the water’s edge). Once in transition, I realized that I was the first of my friends to get back and one of the first in my age group as well. I quickly took off my wet suit, put dried off my feet, put on my socks and cycling shoes, and got my helmet on. 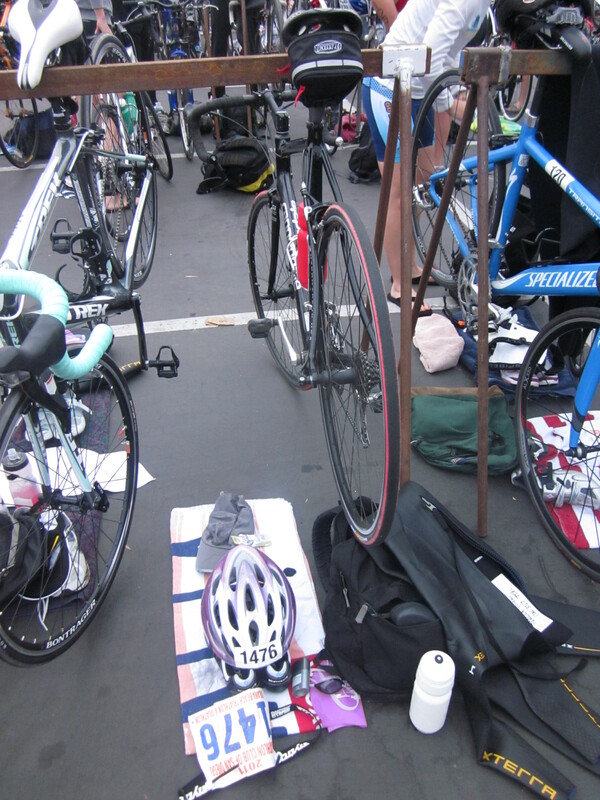 I grabbed my bike and trotted (when running in cycling shoes you kind of have to awkwardly trot because of the way the clips poke out on the bottom of your shoes) to the transition exit in anticipation of my most feared portion of the triathlon – the cycle! I smoothly clipped into the bike without an issues and made my way out of transition and onto the course. The course is two 4.5 mile loops with very tight turns at each end, plus a newly added triple turn (basically turn right off the course, ride 10 yards, make a u-turn and turn back onto the course) in the center of the loop. So although I could really get my speed up at some points, I had to slow down several times. The first part of the course is fairly basic – no hills. However, after the aforementioned U-turn loop, the course heads north into Cardiff and there is a fairly nice downhill portion. Although the benefit of this downhill was offset by the heavy headwind once you reached the bottom. I found myself pedaling hard at the bottom of the hill rather than being able to fully use it’s momentum. The way back up the hill was farily difficult and I put my bike into high gear and got out of the saddle both times as I made my way up it. The bike portion is cool because you can see everyone (ie your competition) several times and can tell if they are gaining on you. I was surpsied that I wasn’t passed often on the bike, other than by men that started in the wave ahead of us. I don’t even think I was passed by a man in the age group 10 minutes behind us until the run. I also had the fun of passing several people on teh bike, including some from my age group and several guys from the group ahead of me. At some point starting at the second loop I was playing cat and mouse with two 16 year old girls wearing matching red sports bras and spandex shorts. One of them was clearly a rookie and nearly ate it during one of the turns because she tried to take it too quickly. However it seemed they really wanted to beat me. Eventually I took a lead on them and kept it and didn’t see them again. The bike was so quick and before I knew it, it was over. I dismounted well and ran my bike into transition, replaced my cycle shoes with running shoes, ate a vanilla bean GU, drank some water and put on my hat. Then I was out of there! After having some trouble running quickly at the Aquathon the previous Thursday (I improved my swim time by 3 minutse but got passed by person after person on the run), I was nervous that I may lose my lead on the run. Since the course is a loop, you see your competition frequently. Also since everyone wears their age group on the back of their left calf, you know when you are getting passed or you are passing someone from the same age group as you (ie moving down/up in the rankings!). I started the run by passing a few people which felt good. I definitely didn’t feel “fresh” but I didn’t feel horrible. For the first two miles I focused on keeping my heart rate within reason while pushing it a harder than comfortable pace. I took water at the aid station on each loop but barely drank – I dumped the rest on my head (at this point it was getting hot!) to stay cool. Mike passed me at about mile 1 of the run, which was expected. I honestly thought he’d pass me on the bike! However, no one else I knew passed me. Once I got to mile 2, I really started pushing it. Near the finish line, a bystander shouted for me to really give it gas, so I did and finished strong! Mike was on the sidelines cheering me on. After the split times were online, I couldn’t beileve that I ran the 5k at a 7:36 average pace! Although I’ve only done two other 5ks in my life (Nov 2008 and Nov 2010) this is a big PR for me! It was such a relief to be finished! I was also so happy that I did so well. I knew that I was in the top half of my age group and felt proud of that achievement considering it was my first triathlon and I had only really trained for six weeks. One of my favorite parts of the race was all the supporters I had there. Asia’s family came and I had several friends competing in and watching the event. I heard my name called at least five times during my race and saw several friends after it was over. I’ve only been in the triathlon community for a few weeks now and I already feel like I’ve met so many people. I can’t imagine what it will be like when I race in this event next year. After we watched the rest of our friends finish and made our way through the crowds, congratuatling friends and being congratulated, we checked the results and sure enough – I came in 23rd place in my age group of 84 women with a time of 1:09:16. I was pretty happy with that number! All I have to do is drop 6 minutes and I’m in the top 3! Mike did well too – he came in 7th in his age group and was off from 3rd by only 30 seconds! If only he hadn’t gotten that cold over 4th of July and spent the last few weeks in bed. After it was all said and done, we headed over to a local cafe with Asia and Jeremy and Asia’s family for breakfast. We spent the majority of the time recapping the race and we all agreed that it was a ton of fun. After getting my split times for the race, I was able to really focus in on what I need to improve on. I have a strong lead coming out of the swim, but I lost it on the bike, with a time that was 28th in my age group. I picked it up on the run, coming in 22nd on that leg. So what I’ve learned from this experience is that I need to bike more! The top finisher biked 7 full minutes faster than me and third place biked 4 min 20 seconds faster. However, the top finisher only outran me by 1 min 48 seconds and outswam me by 1 minute 41 seconds. Another good exercise would be to run after the bike. Although my time was great, I know that I could improve it by working on running after swimming or biking. The only BRICK workouts I’ve done so far have been the practice triathlons and the aquathons put on by Tri Club. I haven’t done a single two sport back to back workout on my own. My next race is September 11 and is the TriRock Olympic Triathlon. 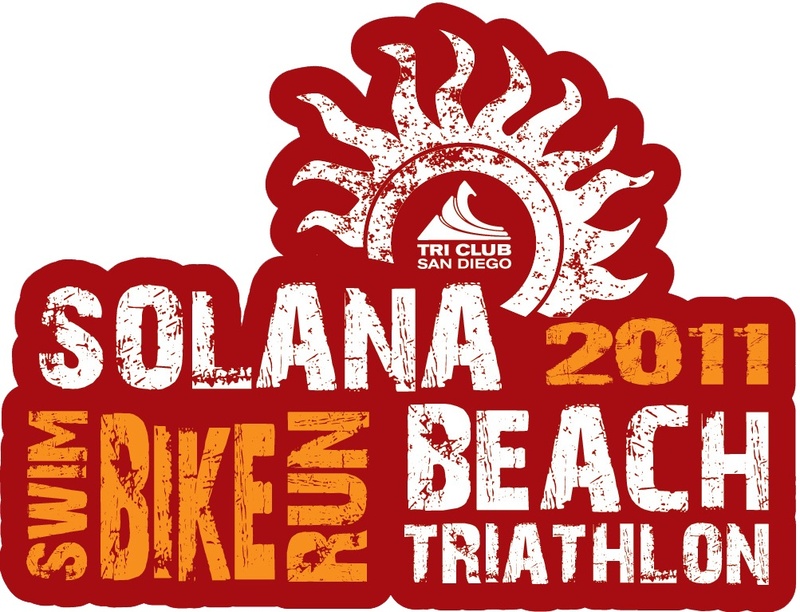 I will swim 1,500 meters (nearly 4x the sprint), bike 24 miles and run 6.2 miles. It’s going to be a test of endurance for sure! My goal is to get on a ride of at least 35 miles before the race and to ride at minimum two times a week. I definitely don’t think I will be fully prepared for the race but at least I know that have some natural ability on my side! 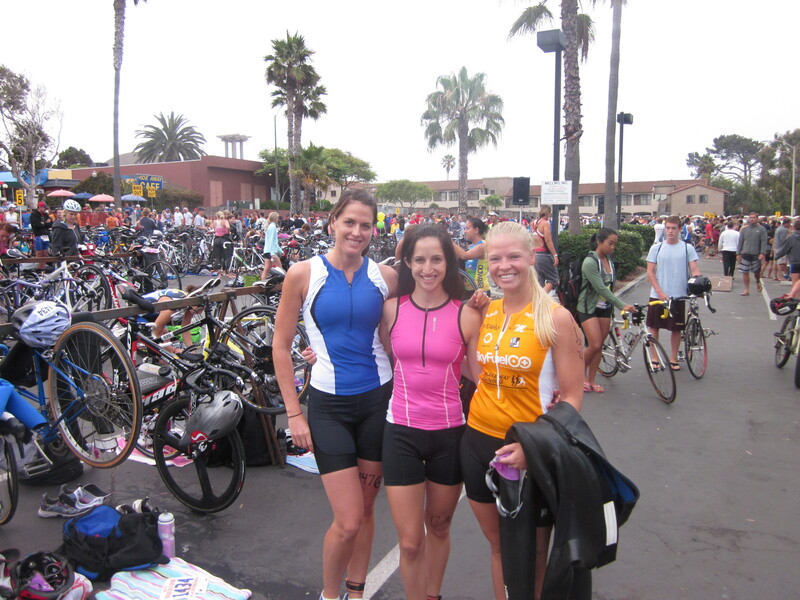 Very helpful for runners who are venturing into the uneasy feeling of “Tri’ing” something new. Sounds like a great experience w/ some helpful tips.